Michael Jackson youtube video of Bad, one of his greatest hits and some great reviews of the album. Michael Jackson to me will always be a king of music. I think thriller was the only purely pop album. Michael understood that pop wasnt the only thing around. I guess we’ll all remember him as the “king of pop” but to me he’ll always be a king of music, period. Bad was a controversial album. How the hell it didnt match Thriller’s numbers commercially will always be a mystery to me. 5#1 songs and 6 other amazing tunes. That’s all the general population cares about anyway..singles. So I cannot see why more people did not flock to buy this album, but now I know why. Around the world, Bad did amazing. It was only judgmental America where he did not even close in comparison to Thriller. Obviously his personal life hurt him in Bad’s sales. What a shame. Honestly Michael Jackson and Quincy Jones made magic happen on this album…again. 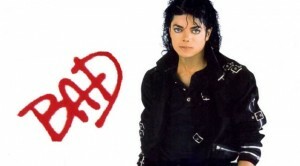 Here is the youtube music video of Bad by Michael Jackson. My favorites are “The Way You Make Me Feel” “Just Good Friends” “Another Part of Me” “Man in the Mirror” “Dirty Diana” “Smooth Criminal” “Leave Me Alone” A great album-which is hard to find in mainstream America. Honestly, just buy the whole album. You will be doing yourself a favor.